Sandy Soule, colleague, B & B travel writer and all around smart lady, has a mantra. “Vertical surfaces are for the innkeepers, horizontal surfaces are for the guests”. All of us at The B&B Team quote these wise words often. We have visited Bed and Breakfast Inns where we have found it necessary to clear the one and only horizontal surface in the guestroom of information booklets, decorative items and more in order to use this space for our personal items. Clutter increases your stress level. Think about it, guestrooms should promote rest and relaxation. We know how many guests arrive stressed out after a long drive or delayed flights or both! You don’t want to create more agitation when your guests enter their room and the first thing they see is a crowd of stuff. All you have to do is Google ‘clutter’ and you can find many articles titled; ‘10 ways to de-clutter your home’ or ‘De Clutter 101’. These articles can be very helpful for your office, kitchen and owner’s quarters which is also very important space for de cluttering but for this writing I want to focus on guestrooms and public rooms. Personal collections placed on dressers, tables, sofas, chairs. These items may be dear to you so you probably don’t want them moved to the floor or hidden in drawers. A guest may find it hard to feel comfortable when they see so much of the innkeeper’s personal items on display. Your common rooms can be great places for showcasing some of these items on a few strategically placed shelves or in designated cabinets. Too many decorative pillows. They only end up on the floor and may be stepped on and kicked around. (Do you want your guests releasing their stress by kicking piles of pillows)? Dried and artificial flower arrangements. Many times these become ignored decorations that fade and collect dust. Dust is clutter too and also collects odors. Yuk! Boxy, out of date TVs take up a lot of space. You may not be able to replace all of them at once but you can replace them a few rooms at a time. Finding wall space for a flat screen can free up much needed horizontal surfaces. Bathrooms really need to be free of clutter. 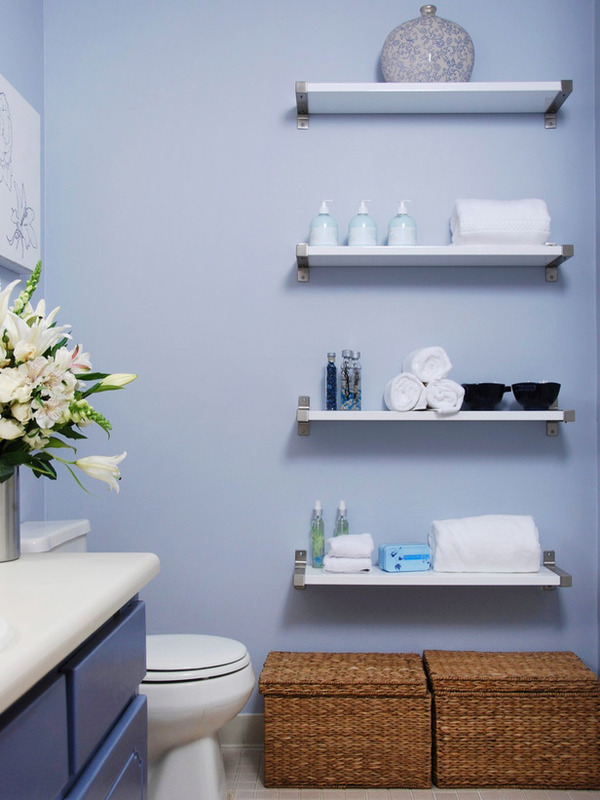 This can be challenging when trying to create those places for your guest’s plethora of toiletries, especially in a small bathroom. Use your vertical surfaces (walls) for open shelves or cubbies. Corners are another place for space saving shelves. ‘Floating shelves’ have been around for a while and are great space savers. Use as bedside tables as well. DO NOT DO THIS, DO NOT DO THAT signs. ‘No’ is a four letter word for innkeepers. 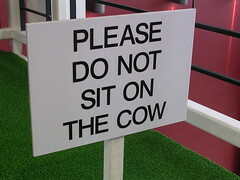 These signs not only clutter the Inn but can clutter your guest’s heads with inhospitable rules. A real stress inducer. There is a reason why spa spaces are simple, clean and free of clutter. Spas require an atmosphere that is relaxing and soothing, think of your guest rooms in that same vein. We have a massage therapist on our office floor and when I asked about her thoughts on de-cluttering she said: “If you want to bring more into your life you must free yourself of clutter.” Your guests may be escaping a cluttered work space and a cluttered mind to seek a much needed respite at your Inn. Your job as innkeepers is to provide the peaceful space where they can experience that much needed break. Action: Take a good hard look at your guest rooms and public spaces and in your mind’s eye (or literally) clear everything out of the room including furniture. Then start putting back the large pieces that are necessary for the functionality of the room. Then return the decorative items that are the most ascetically pleasing to your vertical spaces and follow with your horizontal surfaces. After that you may find the room has a much more open and cleaner feel than before and many of the smaller decorative items you think you love can go away. Next step, yard sale! This entry was posted on Friday, February 10th, 2012 at 4:53 pm	and is filed under Interior Design. You can follow any responses to this entry through the RSS 2.0 feed. Both comments and pings are currently closed. I loved this article. Not sure when you wrote it but as you know from our recent conversation I experienced this in January. 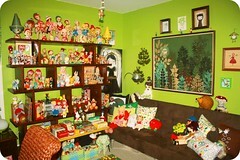 There were so many stuffed toys and dolls the room was actually scary. I placed the doll with the articulated eye lids in the corner facing the wall. The pillows on the floor and the stuffed animals in the closet. The whole place every inch of wall was covered with dried dusty flowers and oversized oil painting and every surface covered. Thanks so much for writing what I wanted to, might quote your blog post in my next blog too!